Whether your business starts out with one product or one hundred products, it’s important to create a smart SKU naming strategy as early as possible. Many companies that start out with only a few products don’t consider how important this aspect of inventory management truly is, yet proper SKU names are an integral factor in efficiently scaling a business. When selling your products through retail or wholesale channels, SKUs allow easy identification of products in your inventory, systems, and sales orders. Read on to learn about why SKU naming matters for your business goals, and learn how to properly name your SKUs for efficiency. SKU is an abbreviation for Stock Keeping Unit. A SKU is made up of letters (and often numbers), and is used to name a specific product for inventory management purposes. The letters and numbers within a SKU are abbreviated and are designed to distinguish products from each other by specifying different variables. SKUs may include naming schemes that indicate the product’s manufacturer, name, model, size, color, description, material, packaging, warranty terms, or other specified parameters. Whatever you call them, they are used to uniquely identify items that your business carries in its inventory. They are important for you, your staff, and the systems you use for tracking inventory, operations, and sales. If you or your system can’t uniquely identify an item, then you will not be able to effectively account for its activity and status in your inventory. SKUs also serve as a convenient shorthand to reference longer item descriptions. Instead of entering an entire product name or the description of an item, your staff can use a much shorter SKU or item number. This greatly speeds up the process of data entry as well as inventory management. Good SKUs make your business run more smoothly – and they make your employees’ jobs easier. Product SKUs often appear on the product, on a sales order, inside inventory management software, and on the warehouse shelf or bin that stores the product. SKUs are unique to your business, so the SKU naming scheme you use in your inventory management system may differ from the SKUs of identical products you order from a manufacturer. Properly named SKUs are an important piece of your company’s inventory management strategy. Good SKUs can be read and understood by staff and can help staff understand what they are looking for – or what they are looking at. If you are outsourcing fulfillment of your products, proper SKU naming is essential. SKU naming also helps you track your inventory at a deeper level, so your product manager can forecast inventory needs with a better understanding of sales data and trends. This will allow you to more accurately predict which product variations you need to purchase more of, so you can avoid stale inventory of less popular products and becoming out of stock on popular SKUs. When reviewing products in your inventory, which are the most important variables to note? Some of the most important indicators may include the product’s manufacturer, name, model, size, color, description, material, packaging, warranty terms, or other specified parameters. If you sell coffee mugs, factors may include: design, size, and color. If you sell apparel, important factors may include: brand, item type, material, color, size. If you sell dining sets, factors may include: brand, item type, material, color, size, and quantity of items within the set. If you sell keyboards, factors may include: brand, model, color, warranty, and accessories. 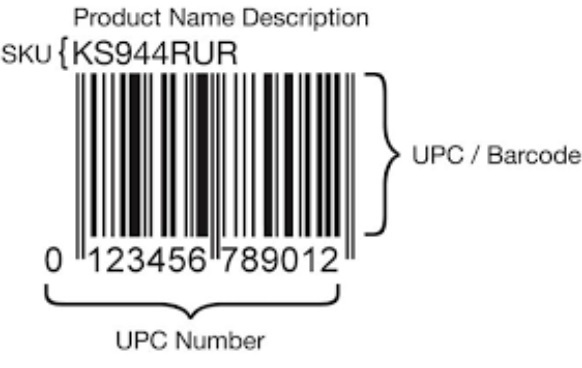 Most important factors (such as item type or brand) should be indicated in the first section of the SKU. The last section of the SKU should indicate the unique variables (such as color or size). For ease of identification, choose the formula that will work best for your business and stick with that when naming all of your SKUs. The more straightforward your SKU naming strategy is, the more efficient this aspect of your business will be. SKU naming affects various roles within your company including your operations manager, sales team, warehouse staff, and customer service team. Name your SKUs in a way that is obvious enough that staff members can read and understand SKU sections with a bit of training. This should go without saying but, when possible, don’t use numbers are letters that can be confused. For example: 0 and O; I and 1; or capital I and lowercase l.
How many SKUs should you have? There is no right or wrong answer for this but, to put it simply, you should have as many SKUs as necessary to create a highly efficient inventory management process. As long as SKUs are names properly and utilize important variables, there is no such thing as too many SKUs. On the other hand, if you don’t have enough SKUs to properly indicate all the variables of products in your inventory, then it’s safe to say you do not have enough SKUs. Ultimately, the best SKU naming system is the one that works for your business. Opt for simplicity and ease when naming SKUs. Once your SKUs are set up, inventory management will be easier for everyone involved.